The evening before Thanksgiving filled our hearts with a little extra joy! Jaime, Steve, and their sweet little boy were in town for the weekend, and we had the opportunity to meet them for a fall Forever Session. Capturing these new memories for our J&A Couples is such a blessing to us! When we talked about different location options for their session, Jaime mentioned that she’d love to find some of the rich fall color that we all love so much. We found the perfect spot right downtown near Big Spring Park and Embassy Suites! That location choice became even more special when their adorable 2 year old discovered a fountain just around the corner. He loooved it! Once he got his eyes on it, his attention was captured. Seeing his joy in that fountain reminded me of how beautiful the simple, everyday things are. There’s nothing like the wonder of a child to see the world in a different way! Something else the little guy loved? Me! *all the heart eyes* Halfway through the session he must have decided that I was pretty cool. He didn’t want me to put him down! We got to spend some time with just Jaime and David in front of the camera in the meantime. I’m well trained in shooting one-handed (hello, bouquet holder), and he even helped me take a few of the pictures! It was the cutest thing ever, and my heart completely melted. 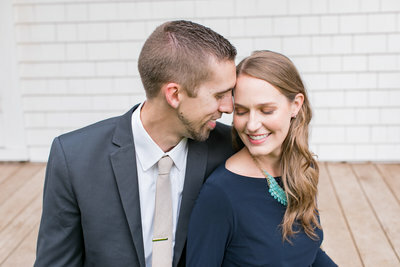 Enjoy this little peek into Jaime & Steve’s downtown Huntsville family Forever Session!